Individuals have broken into Fon Koze, the local microfinance institution, in Thomonde Haiti and stole 3 million gourdes. 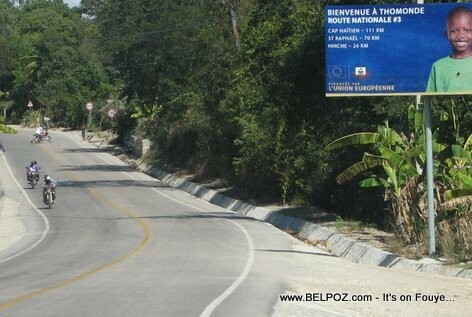 Yes... ONLY 4 police officers in Thomonde Haiti, a town with 57,000 residents. And people are shocked because there was a bank robery? Fondasyon Kole Zepol (Fonkoze) is Haiti's Alternative Bank for the Organized Poor. Fonkoze is the largest microfinance institution (MFI) in Haiti, serving more than 56,000 women borrowers, most of whom live and work in the countryside of Haiti, and more than 250,000 savers. Nou mele, kenbe la Fonkoze .Haiti mele vre Bondye. pa okipe bann vole yo.se yok vole lajan an anko. jiskile payi sa ap soti nan trou l ye a. koman w ta fe kwe yon kote ke yo kimbe lajan pa gin siveyans, min m kamera te ka fe travaye la.ou pap woe sa nan okinn lot peyi ke haiti. yo konn sa yo te gin pou yo fe.yo min m ki vole lajan.